The history of wrestling games mirrors the history of other sports games fairly closely, insofar they’ve come from 8-bit, arcade style affairs that only kinda reproduce the action we’re used to seeing, becoming fun, but still very flawed 16-bit games in the ’90s, and eventually the juggernaut franchises with every bell and whistle imaginable that we see today. Usually though, there’s a game on each system that one could point to and say “that’s when they started getting it right”…and in the NES’s case, that game was the first wrestling game churned out for it, and quite possibly the first wrestling video game ever, Pro Wrestling for NES. That would be a bad way to take a piledriver. Pro Wrestling allows you to select from a half-dozen fictional wrestlers in pursuit of the Video Wrestling Association title, currently held by King Slender, who I suspect might be a Ric Flair knockoff. Challenging for Slender’s crown are Fighter Hayabusa (who is BLATANTLY Japanese wrestling icon Antonio Inoki), Star Man (imagine if Green Man was a pink and purple luchador), Kin Corn Karn (the Korean “evil foreigner” gimmick), The Amazon (dirty, cheating heel Swamp Thing), and Giant Panther (who I believe is a certain orange ‘roid-beast, bruther). 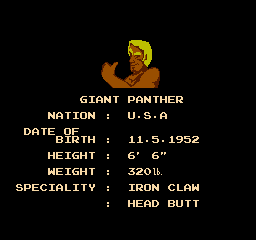 Whoever you pick, you’ll fight your way through everyone in order, win the title, and if you defend the belt ten times, you’ll square off against Great Puma, who serves as the Punch-Out Mike Tyson-esque final boss. Sadly, that’s the only game mode, aside from battling a buddy in 2-player mode. There are no options to be found here, not even the inclusion of tag team matches, which is disappointing, to be sure, but what the game lacks in depth, it makes up for with reliable, solid gameplay. Unlike most early wrestling titles, which were largely punch-kick-pin affairs, you actually have a surprisingly deep moveset here. You have your basic strikes, bodyslams, piledrivers, back suplexes, brainbusters, as well as the ability to whip opponents into the ropes and meet them with a clothesline or a high knee lift. 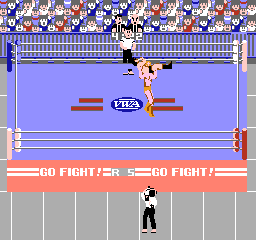 You also can climb the top rope and launch a splash or a diving knee drop, and coolest of all, perhaps, if you send your opponent to the floor, you can get a running start and plancha over the ropes onto your downed opponent, which was a move you’d rarely see in real wrestling at the time, let alone wrestling video games. And if all that wasn’t enough, each wrestler has one or two signature moves, like Star Man’s somersault kick or King Slender’s backbreaker. 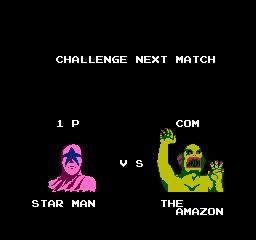 Now, the special moves replace standard moves, so Star Man has the somersault kick instead of a piledriver, for example, but it’s still a very nice addition that adds a bit of character to the wrestlers. Also, much like Fire Pro, you can’t go straight to the big moves; unless you wear your opponent down with some standing strikes or simple slams, going for a brainbuster or piledriver is just going to get reversed, but seeing as how matches last only five minutes, it doesn’t take too long to bust out the big guns. DAYMAN! NIGHTMAN! Winner gets the soul of Charlie Kelly! All of these moves are easy to pull off, as well, thanks to excellent play control. The fighting system works a lot like the later Fire Pro series, with grapples initiated by making contact with your opponent, and the first person to input a command after the lockup wins the grapple. All the moves are the same button combinations for each wrestler, so Left and A at the grapple will always be a back suplex, for example. Double-tapping left or right in the ready position makes you run, which ordinarily is a recipe for disaster, but I never had any problems starting or stopping. Again, veterans of wrestling games would be amazed at how much stuff this game got right that later games managed to screw up so badly. In fact, PW gets a lot of little things right in the presentation department. 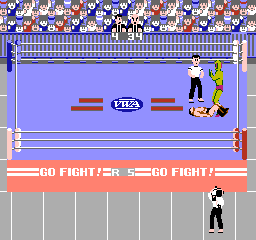 The referee is actually in the ring with you instead of being a disembodied character, and it’s neat to watch him race out of the way of the wrestlers and sprint over to count pins, as well as counting to five when you’re on the top rope, which is a nod to old-school wrestling rules. There’s also a cameraman outside the ring who faithfully follows the action, and a commentary team tucked at ringside. Also, the crowd pops huge for signature moves, and the heelish Amazon even tries to plead innocence to the ref after his dirty specialties. Aside from that, however, the graphics and sound aren’t exactly spectacular. 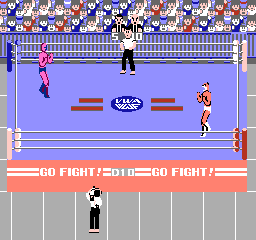 Surprisingly for an early NES game, the wrestlers aren’t drawn up in an overly cartoony fashion, instead, they’re drawn to look like regular people, but they’re all rather small, which is rather antithetical to the larger-than-life characters in mid-’80s wrestling, and it’s really pronounced when you see how cavernous the ring looks by comparison. Animation is a bit on the stiff side, and most moves appear to be comprised of two frames of animation, but this WAS 1986, so I think I can let it slide. One graphic detail that shouldn’t be overlooked is the facial expressions on the wrestlers, from straining to lift up an opponent to the shock of getting hit with a perfect spin kick…and yes, there’s a little bit of Engrish to be found here; this is the game that spawned the now-legendary “A Winner Is You”. The sound is very bleepy-bloopy synthesized noise, including one theme that plays in the background for every match that will make you glad the matches are so short. On the upside, as you take punishment, the game gives you a rough idea of how beaten up you are with warning tones; a lower pitched series of beeps for caution and a higher pitched, panicky tone for when you’re in danger of being pinned, which is good seeing as there aren’t any health meters or any sort of information on-screen besides the timer. All in all, Pro Wrestling makes for a really solid wrestling game, especially for a such an early venture into the genre. I would’ve liked to see tag matches, and some options for no countouts or longer match lengths, but I’m definitely glad they got as much of the fundamentals like special moves and play control right from the jump. It’s an arcade-style experience, so it’s probably not going to hold your attention for much more than a lazy afternoon, but it’s quite decent while it lasts, and I think you can make a pretty strong case that it’s the best of the NES wrestling titles. I definitely recommend giving it a try if you’re a fan of pro graps or if you want to see where the genre started, but piece of advice, when you get to Great Puma, heed the advice of the late Eddie Guerrero: Cheat to Win. Fundamentally sound in terms of gameplay, gets a lot of the little things about wrestling right. No different types of matches, no options, small roster. 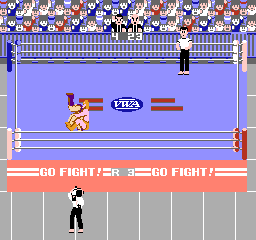 This is so much more playable than any NES pro wrestling game (outside the ring, character-specific special moves, etc), and it wasn’t until a review here that I realized even the first 16-bit WWF game didn’t have any character-specific moves. A good pick on “Play Choice 10”. Also I remember losing a match that we thought would be “Game Over” at a friend’s house, and as he pressed down the “power” button, it turned out I got to keep playing, and we made him hold the “power” button in its “pressed down but not released, thus the NES is still on” position for 10-20 minutes while I kept playing. My one complaint: those loser(s) on the game’s pixelated cover art — why is a weenie version of Fighter Hayabusa back-body-dropping Dig-Dug?! Well, since that opinion is based on the SNES version, it’s understandable. Heh, I didn’t mean to start a kerfluffle — there’s nothing wrong with deciding to review games that one has an active interest in; it means that one can bring enthusiasm (for positive or negative things to say), context of similar games, etc. Not a kerfuffle, I thought it would be a fun challenge! Awesome review UD and this game came out when I was only 2 years old! Actually the very first wrestling game for the NES was Tag Team Match: M.U.S.C.L.E. which was originally released in Japan in November 1985 and then slightly before Pro Wrestling outside of Japan in October 1986 (Pro Wrestling was released on 21st October 1986 in Japan and in 1987 in the rest of the world. . The very first wrestling video game to my knowledge is Tag Team Wrestling (known in Japan as The Big Pro Wrestling), created by Technos and first released in 1983 in the Arcades. It was then ported in 1984 to various systems like the C64, Apple II, PC and in 1986 to the NES. The game and it’s Tag Team the Strong Bads provided the inspiration for the character Strong Bad from Homestar Runner. As for Pro Wrestling: It’s OK, it of course aged badly just like all Wrestling games that were released before Fire Pro Wrestling showed everybody how to do it right.